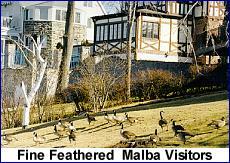 Malba is an enclave of 406 houses just west of the Whitestone Bridge existing in peaceful isolation. The streets in Malba are winding and the beautiful homes have landscaped gardens and circular drives. For some, Malba is a hard place to find and exit from. Once inside this small community, it's hard to remember why you want to leave. A drive through the quiet, hilly streets attests it is country living in the big city. The waters of Powell's Cove lap gently against the northern edge with beautiful vistas of the Whitestone Bridge to the right and Manhattan's skyline to the left. Indeed, the quack of a duck can still be heard in the bordering wildlife preserve and even on the lawns. The gathering of bobbing ducks, snow egrets, sandpipers, terns and other marine birds crowding on the shallow river's edge is a common sight. Malba has no commercial complexes or multifamily houses. The combination of easy proximity to the city and the rural nature of the community minimizes the turnover of homes in Malba. Beginning in the 1970's, many of the older homes were bought and gutted to the ground only to be replaced with even more spectacular architectural creations. The trend continues because property values justify it and empty lots cannot be found. Many of the homeowners are not first-time buyers but have upgraded through the years to larger homes. Springtime is a delight to the senses in Malba. The scent of freshly mowed Fine Feathered Malba Visitors grass, arching trees with pale green leaves, forsythia, blooming dogwoods, wild cherry trees and azaleas proclaim "It's Spring!". Bedded tulips and daffodils adorn most homes. This sets the scene for the College Point Roadrunners Club for its annual 13.1 mile half-marathon which runs through the streets of Malba each year. 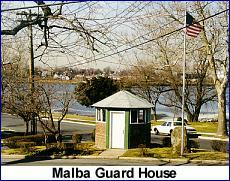 The civic-minded volunteers of Malba are active in Community Planning Board #7, the 109th Police Precinct Community Council and maintain a close alliance with The Greater Whitestone Taxpayers Association and The College Point Civic Association. Many of Malba's residents are active Block Watchers reporting directly to the 109th Police Precinct.